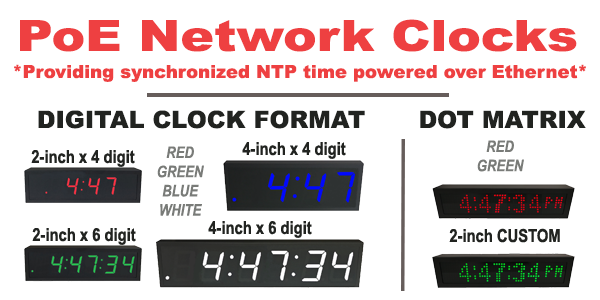 Applications and Uses of NTP PoE and WiFi Network Displays | TimeMachines Inc.
NO... they do so much more! YES!!! 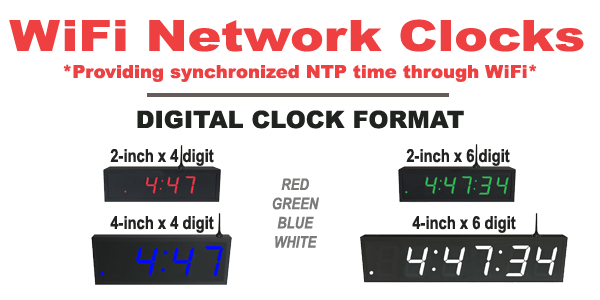 NTP is used to synchronize these displays throughout your network, whether WiFi or PoE, we've got you synced up! Can they show the date? YES!!! All of our models can alternate between displaying either time or date, or systematically alternating between the two. Can they be a timer? YES!!! You can manage all of your TimeMachines devices independently, within select groups, or all together to use the various date, time, and count up/count down timer features. TimeMachines keeps things synchronized, yet flexible to meet your needs! How can these displays help me? Clocks, dates, timers, and messages - the flexibility of these network timing devices can really streamline and improve the efficiency of your workplace! Take a look at the breadth of how our customers use these now! OR click on the applications below to see how these TimeMachines Displays can work for you!